Secular Pro-Life Perspectives: Be the Solution. It’s easy in the pro-life movement to complain about the problem of abortion. What is difficult is actually providing concrete and helpful solutions for women facing unexpected pregnancy. If we are truly dedicated to ending abortion, we need to direct our attention to the reasons many women give for having abortions. By understanding the underlying reasons for a woman choosing to get an abortion, we can begin to find solutions for her that will solve the problems she’s facing without her feeling like she has to eliminate her child. 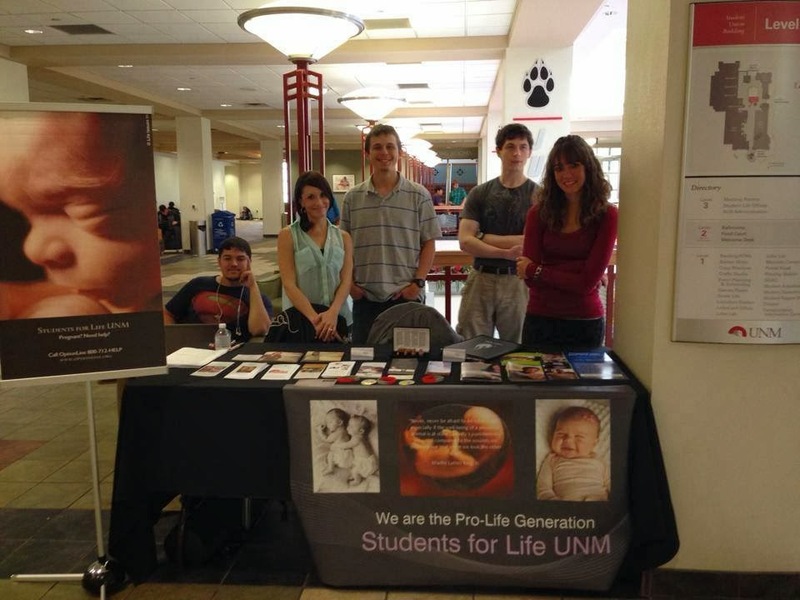 When we began the Students for Life group at UNM, I knew that I didn’t want to just do education and activism events. I wanted to actually begin changing the environment on campus to be more accepting to pregnant women. I looked on the Students for Life of America website and found what they call their Pregnant on Campus Initiative. This initiative is designed to provide resources, help, and understanding to women facing unplanned pregnancy while they are still in school. The goal is to help the woman have her baby and continue pursuing an education. We table every Friday from 10 a.m. to 2 p.m. in our Student Union Building, with booklets and brochures full of information regarding home-visiting programs, local pregnancy resource centers, day cares, etc., and we have post-abortive counseling information ready in the event that we encounter post-abortive women. Any time someone approaches our table we give them information and ask what they need help with specifically. We never judge them for their past and do our best to show them understanding and compassion. In addition, we recently launched a website with pregnancy and parenting resources for students who do not feel comfortable approaching us about their situation. Our goal is to be available for women in their time of vulnerability so that they know that they are not alone. We want to show them that choosing life for their baby does not mean they have to give up the life they want. Unplanned pregnancy is not a dead end for parents; it is just a new path that leads to a different but equally fulfilling life. If we are serious about ending abortion and providing real solutions for women, then we need to begin providing those solutions now. Not just on our campuses, but throughout our nation. Unplanned pregnancies are not going to go away when abortion is made illegal. By understanding this, we can begin creating a culture of life that will continue to grow after we've abolished abortion. It is our job in the pro-life movement to be the solution for women, so that abortion is no longer even a consideration for them. The simplest solution of all: "Put Your Money Where Your Mouth Is." if you want various unwanted pregnancies to be carried to term, then you should pay for what you want. You have no right whatsoever to insist that others should pay for what you want. When you decide to pay for all the pre-natal costs, the birthing costs, and all the food, clothing, shelter, education, toys, etc., for 18 years after birth, of every unwanted pregnancy, then you can expect to see a big reduction in the abortion rate. But even if you did, it wouldn't last. That's because you will have created an "ecological niche", which is defined as "any environment in which organisms can survive and successfully reproduce". Every ecological niche has a limited supply of resources. You will eventually and inevitably go broke. And after that, the abortion rate will climb right back up to about the same as where it is now. So you might as well not bother in the first place, because there is no chance you can win in the long run. Abortion saves on my future tax dollars so I don't have to pay for what pro lifers want. Here is something for pro lifers to chew on.